or did you ever want to climb every mountain!!?? enjoy with your friends time and time again the thrill of travelling with Sister Maria and the Von Trapp family as they sing and dance their way out of pre war Nazi Austria and straight into your living rooms for a sparkling evening of nostalgic entertainment. 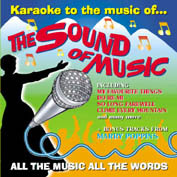 This CD is sure to appeal to the millions of Sound Of Music fans across the country that have made the movie one of the enduring musical classics. Many of those fans will have attended one of the regular touring Sound Of Music sing a longs shows and will be looking for just this release as the perfect souvenir of the show and to help them to put on their very own show tin the comfort of their own homes with friends and family around them...altogether now..."Doe a deer a female deer.... Ray..."
As an added bonus we have also included 6 classics tracks from Mary Poppins for you to sing along to too.